(Montreal, Que.) 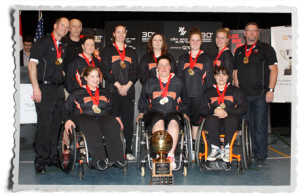 The Edmonton Inferno are national champions after defeating their provincial rival the Calgary Rollers 61-52 at the 2013 Canadian Wheelchair Basketball League (CWBL) Women’s Championship at the Collège Édouard-Montpetit in Longueuil, Que. The victory marks the seventh national championship title for the Inferno and their first since 2009. A scorching Inferno offence led by Arinn Young proved too hot to handle for Calgary. Young, of Legal, Alb., led Edmonton with 26 points. Diane Sorensen (Calgary, Alb.) was the top point producer for the Rollers with 23 points, as Calgary seized its second consecutive silver medal at the event. The hometown team from Quebec captured the bronze medal for the second consecutive year in a decisive 56-32 win against the BC Breakers. Jade St-Pierre (Montreal, Que.) tallied a game-high 18 points for Quebec while teammate and national team veteran Cindy Ouellet (Quebec City, Que.) added 12 points. Makiko Harada (Vancouver, B.C.) and Wendy Jansen (Kelowna, B.C.) produced 11 points apiece for the Breakers. Saskatchewan picked up its first win of the tournament to secure fifth place by conquering Ontario 64-59. Ouellet was named the most valuable player of the tournament. Tamara Steeves (Ontario), Alarissa Haak (Edmonton Inferno), Amanda Yan (BC Breakers), Arinn Young (Edmonton Inferno) and Jessica Forgeron (Calgary Rollers) were named to the all-star team. The 2013 CWBL Women’s Championship was held in conjunction with the Défi sportif AlterGo.